What’s wrong with practicing mindfulness to become better? Hollywood actor Richard Gere visited Bangalore last year en route to a nearby monastery to meet Dalai Lama. He commented that he had been practicing meditation for more than 40 years and yet the wait in the immigration queue at Bangalore airport ticked him off1. He said, “I cannot claim to have had any breakthrough”. Forty years of meditation practice is a long time, isn’t it? But what if 40 years is not enough? Perhaps he is just joking? Or he may not be practicing it right? Or perhaps mindfulness involves something more than a practice? Perhaps this meditation stuff is a hoax? Any of these could be true. However, in this article I would like to explore the possibility that mindfulness involves something other than practice. Let’s start from the first principle. Mindfulness is about seeing the reality as it is. But that definition is slippery because thought distorts perception and creates cognitive illusion. Hence, it is difficult to know if what I am perceiving is real or illusory. Suppose I see that my boss is stupid. Is it real or an illusion? I won’t know unless I investigate it further. Hence, an alternate view of mindfulness is – it is an investigation into potential illusions created by thought while thinking. One name which is well known when it comes to investigation is Sherlock Holmes. 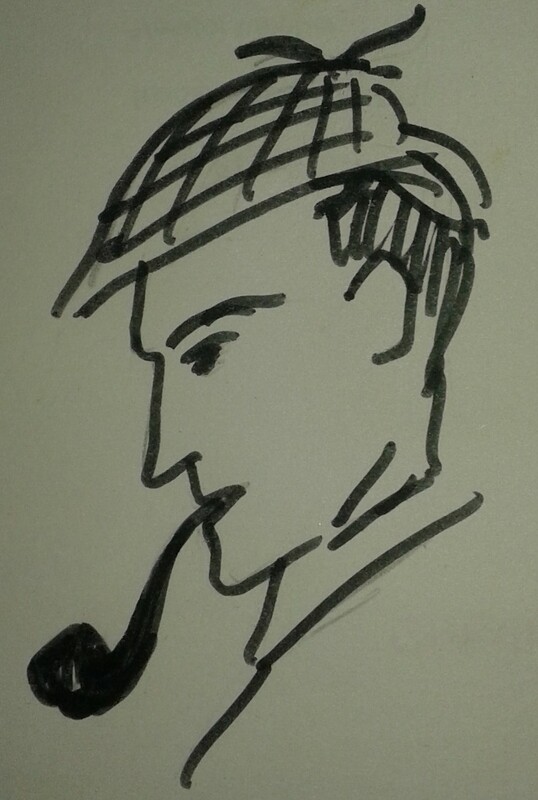 Have you ever heard or read that Sherlock Holmes is practising something when he is investigating a case? I haven’t. Of course, he sometimes practices his violin. But we don’t say that violin practice solves mysteries. Investigation is a creative process. You can’t follow fixed steps in an investigation. However, you may build stamina by practicing various tools useful for investigation. Holmes practices in places like chemistry lab where he performs experiments to build diagnostic tools. Similarly, it may be useful to practice observing your train of thought when you are in a relatively undisturbed state perhaps seated with eyes closed in a corner of a room. That may build some stamina in retaining attention when it is needed most. Which is when? Now, here is a hypothesis – every time there is a negative emotion – in the form of worry, anxiety, anger, guilt, blame etc., there is a cognitive illusion lurking behind it. Thus awareness of a negative emotion indicates the arrival of a case for investigation. Like Richard Gere, if I am in a queue and getting irritated of the wait and if I become aware of my irritation then that means in Sherlock Holmes’ language – a case has arrived. One common reason why we become upset is when our self-image is under attack. For example, I may be mad at my boss because he has hurt my self-image. We value our self-image more than anything else and constantly seek to protect or enhance it. This process is sometimes referred to as the process of becoming. Becoming… a lean, wealthy, healthy, spiritual, famous, well-respected – pick your favorite adjective – person. Thus the original hypothesis leads to following – For every negative emotion there is a “process of becoming” lurking behind and in friction with the potential damage to the self-image. Hence, one can look at mindfulness as an investigation into the process of becoming. In summary, we are saying that mindfulness is more of an investigation than a practice. Moreover, it is an investigation into the process of becoming. Hence, if you say you are doing it to become better, you are getting into a conflict of intent – kind of a paradox. How can you investigate the process of becoming to become better? Richard Gere’s comment on the lack of breakthrough is mentioned in this article titled “Gere springs a surprise” from The Hindu, Dec 8, 2015.